Back row, left to right: Madhu Narayanasamy, CDM Smith, Houston; Timothy Miller, AECOM, Chelmsford, Mass. ; Jeffrey Saunders, Thompson-Arthur Division of APAC-Atlantic, Inc., Greensboro, N.C.; Jason Fischer, The Great Lakes Construction Co., Hinckley, Ohio; Erin Coats, CH2M, Santa Ana, Calif.; Nick DiBartolo, Rogers Group, Inc., Columbia, Tenn.; Robert Alger Jr., The Lane Construction Corporation, Chantilly, Va.; David Leber, Wagman Heavy Civil, Inc., York, Pa. Standing in front, left to right: Dan Holley, 3M, St. Paul, Minn.; Richard Ames, AECOM, Conshohocken, Pa.; Matthew Mullally, AECOM, Chelmsford, Mass. ; Rick Both, Parsons, Summer, Wash.; Louis Barragan, Gannett Fleming, New York, N.Y.; Matt Blake, Parsons, Westminster, Colo.; Sofia Berger, Louis Berger, New York, N.Y.; Johnny Limbaugh, Wright Construction Group, Fort Myers, Fla.; Kevin Oberheim, Rummel, Klepper & Kahl, LLP, Baltimore, Md. Seventeen emerging leaders in the transportation design and construction industry participated in an intensive Washington, D.C., “boot camp” introduction to the federal legislative and regulatory processes, including a trip to Capitol Hill to urge their members of Congress to find a permanent revenue fix for the Highway Trust Fund (HTF) and to fully fund the FAST Act for FY 2018. 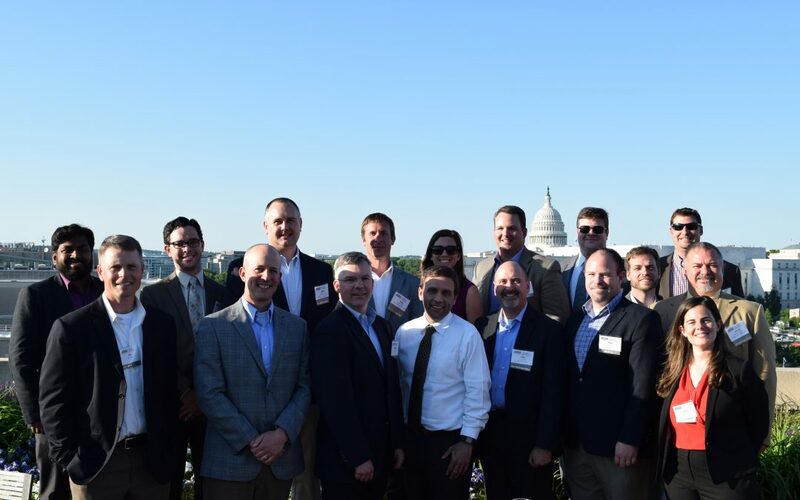 They were in the Nation’s Capital May 16-18 as part of the ARTBA Transportation Development Foundation’s (ARTBA-TDF) Industry Leader Development Program (ILDP), an annual event held in conjunction with the association’s Federal Issues Program and the Transportation Construction Coalition Fly-In. The ILDP provides participants with a solid understanding of industry economics, how transportation work in the U.S. is funded and financed, how actions by the federal government impact the industry, and how they—and their company or agency—can become politically engaged. There have been nearly 700 graduates from over 200 industry firms in the program since it began in 1996 as the Young Executive Development Program. House Highways & Transit Subcommittee Chairman Sam Graves (R-Mo.) addressed this year’s ILDP attendees about the need to provide a permanent HTF solution and shared his views about federal aviation policy. Robert Alger, Jr., business development manager, Lane Construction Corporation, Chantilly, Va.
Richard Ames, senior project manager, AECOM, Conshohocken, Pa.
Luis Barragan, director of transportation, N.Y., Gannett Fleming, New York, N.Y.
Sofia Berger, senior vice president, U.S. transportation market, Louis Berger, New York, N.Y.
Matt Blake, lead construction estimator, Parsons, Westminster, Co.
Rick Both, vice president, Parsons, Sumner, Wash.
Erin Coates, bridge engineer, CH2M, Santa Ana, Calif.
Nick DiBartolo, general manager, Rogers Group, Inc., Columbia, Tenn.
Dan Holley, marketing manager, 3M, St. Paul, Minn.
David Leber, project manager, Wagman Heavy Civil, York, Pa.
Johnny Limbaugh, director of business development & government relations, Wright Construction Group, Fort Myers, Fla.
Timothy Miller, civil engineer, AECOM, Chelmsford, Mass. Matthew Mullally, project manager, AECOM, Chelmsford, Mass. Kevin Oberheim, project manager, Rummel, Klepper & Kahl, LLP, Baltimore, Md. Jeffrey Saunders, estimator/performance manager, Thomson-Arthur Division of APAC-Atlantic, Greensboro, N.C.